Whisk batter ingredients together until smooth. Set aside for 45 minutes I placed it in the refrigerator due to the raw egg. First, Whisk batter ingredients together until smooth. Set aside for 45 minutes (I placed it in the refrigerator due to the raw egg). Place chicken pieces into the batter you made earlier. Stir to coat completely. Fill wok halfway with canola oil and bring to 370-380 degrees. Deep fry chicken pieces, adding one at a time, until golden brown, about 15 minutes. Remove chicken and keep warm. Remove oil from wok and wipe out with paper towel. Add 1 tablespoon of olive oil (or canola oil) and stir fry broccoli and peanuts until broccoli is tender crisp, about 3-4 minutes. Add the sauce and stir gently until it bubbles. Add chicken and stir to combine, coating chicken pieces with the sauce. Sprinkle with sesame seeds and serve over a bed of rice. 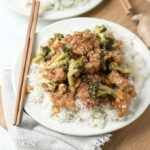 This recipe for Sesame Chicken was printed from AmandasCookin.com - https://amandascookin.com/sesame-chicken/ and can only be printed for education or personal use.